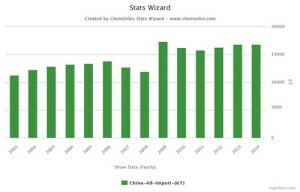 Along with the reveal of the June import statistics, China’s overall imports for polymers posted a decrease for three consecutive months following a record high in March. 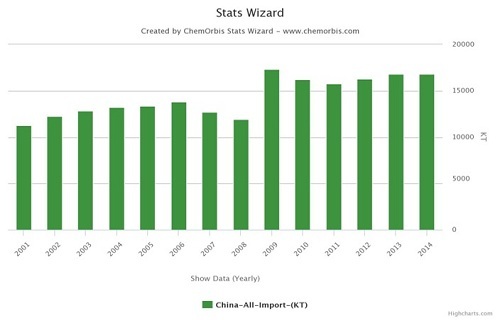 This has been the first time China saw decreases in polymer imports for three months in a row since 2011, according to ChemOrbis. Nevertheless, overall imports for the first half of 2015 indicate an increase when compared to the same period of last year albeit a small one. On a product basis, there is an increase in the imports of all products except for homo PP and PS. The largest increase for the first half is seen for LLDPE, where imports gained 17% on a yearly basis. PVC imports gained 15-16% as well in the first 6 months of this year when compared to the same period of last year. This was followed by a 12% increase of PP copolymers and an 8% increase of HDPE products in the same timeframe. LDPE also recorded a small increase of 2% in the first half on a yearly basis. On the other hand, homo PP imports saw a decrease of 8% and the loss of PS was even larger at 15% in the first half of the year in comparison to the same period of 2014. China’s growing PP capacity in line with the start-up of new coal/methanol to olefin/polyolefin plants was the major reason behind the yearly loss for the first half. Thanks to these investments, China’s dependency on import PP is expected to decrease more in the coming years with analysts even forecasting self-sufficiency for China in the long run. The shrinking share of import PS, meanwhile, can be mainly attributed to the replacement of some PS applications with other products. Converters have been gradually switching to EPS, PP or even PET depending on their applications due to higher and more volatile prices for PS. On a country basis, China’s top 5 suppliers of overall polymer imports changed only in the order in the first half. Saudi Arabia managed to increase its market share in China by 2.5% and became the top supplier, outpacing South Korea whose market share dwindled by 2% in the first half. Taiwan, the third largest supplier, also lost its market share in China by 3% while Iran made a remarkable increase in the first half by exporting 7% more in the first half of 2015 to China when compared to the same period of last year. When the countries are analyzed for homo PP imports, which are more prone to changes in dynamics, South Korea appears to maintain its share while Saudi Arabia lost 5% in the first half on a yearly basis. Taiwan’s market loss was much more significant at 34%.